The enormous work done by Justice Santosh Hegde as the Lokayukta of Karnataka is an eye opener for the anti-corruption movement. Despite the constraints of the law, his investigations and reports have led to many important politicians to see the insides of a jail. Unfortunately, the political class in Karnataka has woken up to the possibility that this Institution of the Lokayukta can not only shut down their financial pipelines but also ensure that Justice is meted out against the corrupt. They are now systematically trying to undermine the office of the Lokayukta and over the last many months, have started the process of dismantling the anti-corruption agency. It is now 5 months since Justice Hegde laid down office. But for a brief period of 35 days, this agency has since been headless. The police chief heading the investigation wing of this agency has been replaced with someone with a questionable track-record. The present imbroglio between the Government and Governor on who should be appointed as the next Lokayukta has led to a stalemate. It is indeed a matter of shame that the Government of Karnataka is insisting on a particular judge and hinting that there is no one else in the State who is qualified to adorn this post. 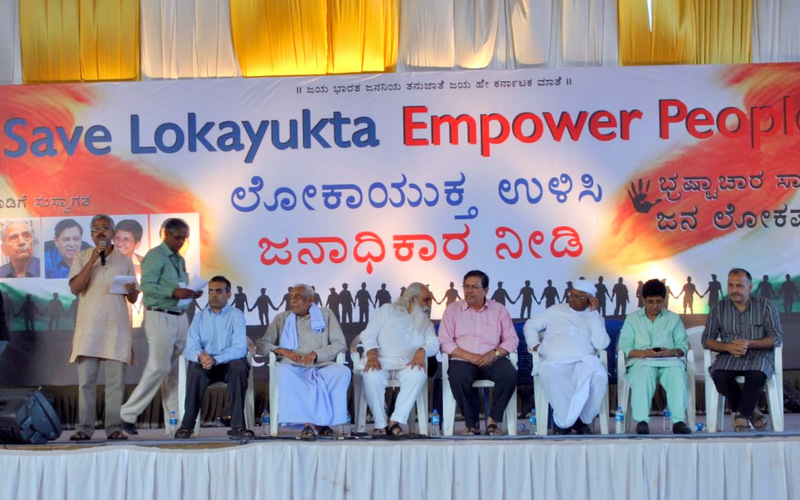 It is against this backdrop that the recent one-day campaign on Dec 17th titled ‘Save the Lokayukta’ organized by the India Against Corruption – Karnataka Chapter acquires significance. Anna Hazare, Kiran Bedi, Manish Sisodia and Dinesh Vagels had come down to Bangalore to lend their support and put this event on the national center stage. Freedom fighter Sri Doreswami, Justice Hegde and I were also present and expressed our views with specific reference to the local issues on hand. The public event was preceded by a closed-door meeting with Team Anna and selected activists from around the State, wherein resolutions were passed demanding strengthening of the Lokayukta Institution. The Public event was very well organized and the volunteers did an excellent job of ensuring that the event went on as per plans. More than 10,000 people attended it and contributed Rs 4.7 lakh towards organizing it. It is indeed encouraging to see such large number of young people keen on engaging with the system and demanding changes that impact their everyday lives. Let us hope that the Government of Karnataka gets the message and gets down to the important task of not only cleaning up the system but also ensuring good governance to its citizens.